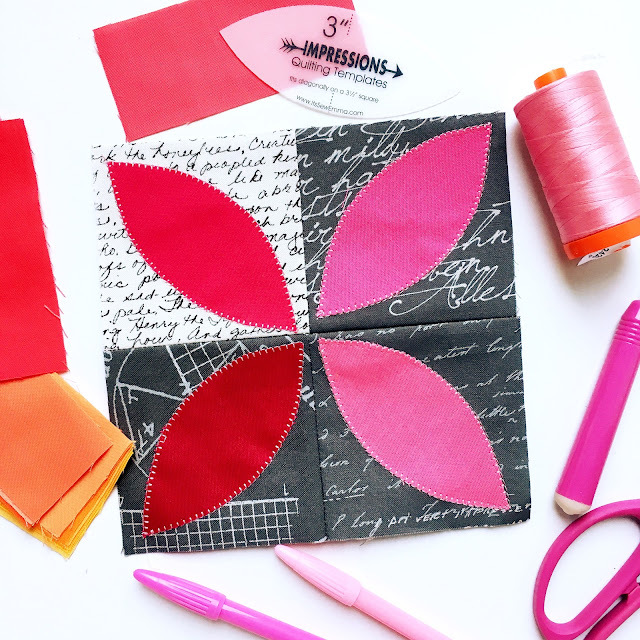 Orange Peel Quilt Block and Template Tip! Some weeks are very slow and steady with plenty of time to accomplish my tasks, sew, write and sometimes even clean a little. This week whizzed by with so much as a "How do you do?" I blinked and it was Friday! There was very little slacking this week so I will blame the Snow Day on Monday for altering reality. Thank goodness I was able to sneak some sewing in yesterday afternoon and also made a short video on a quick tip for tracing templates! The Orange Peel Template is from Fat Quarter Shop! I decided to try the 3" template. I made this block with four very different colors of solid pink/red and appliquéd the pieces using my Bernina 440 QE and only one color of Aurifil thread. The one color of thread blended perfectly with all of the colors I chose! When I went looking for my marking pen to trace the peel, I realized I had the PERFECT way to trace that did not require a pen or chalk at all! It is fast, easy and so far my kids have not taken it from me! Great tip!!! Thanks!! Now all I need are those templates!! Ah! I have those templates. I have been drawing around them after I nicked off a tip on one of them with the rotary cutter. I think I have a very old pattern wheel in my sewing kit from (gasp!) high school Family Life class. It was in that class that I learned to use a sewing machine. must try my tracing wheel it was my grandmothers she died in 1956! I also use a hera marker that works well. 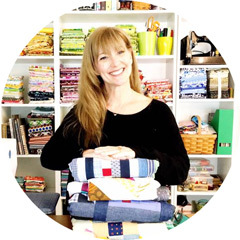 I have a stack of 'precut' orange peels from cutting drunkards paths so don't need to worry about the template, but I'd love to know what stitch you used to applique them on with. I can't throw the 'scraps' away and this is a great way to use them. Thanks for sharing this. It is a great idea!